Though education is a lifelong process, the first quarter of human life is focused more on it. Then the second quarter of life is focused on utilizing the education received into the wealth earning tool. Those who understand the essence of the Indian way of living and the 4 segments of life understand quite easily and convincingly. While education and learning are two important aspects of life and mostly considered as a single unit where both the aspects are weaved with each other so nicely and effectively that they are almost inseparable. And true education includes learning, without a doubt. Various civilizations across the world have introduced different education systems and tried to improve it over the period of time. It is wrong to say one of them as the right one and others are wrong. The people behind the system have tried giving their best to society via education system in order to help the next generation to become smarter and possessor of better knowledge. At the same time, we see that, with the passing time, some theories became so popular and so rigid, that they almost kill the essence of the motive behind the education system itself. Here is the cover page of the book. The cover page of the book has to be very effective in order to create the right impression of the book. Consider it as a gateway to the source of knowledge, information or the story explored in the book. A right and effective cover impacts reading and/or purchase decisions for sure. The cover page of the book, as you can see, is created with minimalist approach. The black background with white text gives an impression of the blackboard, the basic most tool a teacher uses to convey his ideas to the students! 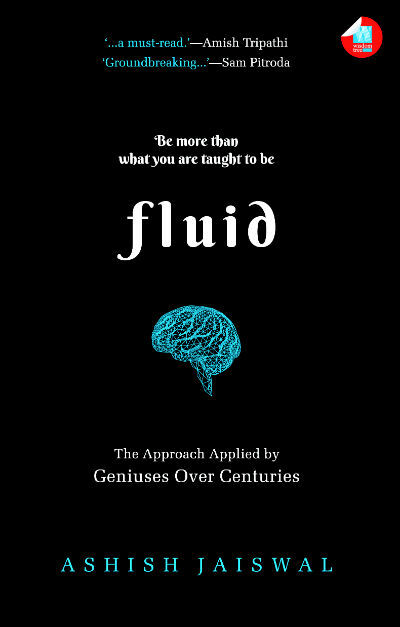 The word “fluid” here refers to the same in the (human) brain. So, a colorful illustration of a human brain adds to the effectiveness of the book cover. The quality of the cover is quite good. The glossy finish gives it a “rich” look. The tagline and other information on the cover page gives an idea about what to expect from the book effectively. Overall a nice and decent book cover. The book is a kind of self-help and motivational book which talks about a philosophy and explores various incidents weaved around the central theme of the book; that is “Education”. So, it is different than the traditional books we come across. There is not a single story to explore nor it is a collection of short stories, though, there are many short stories weaved in the book quite nicely. In fact, the book starts with a few short stories explored each of them as a separate chapter. These stories explore the way we think about education and career. The theory of people involved in scientific or logical activities uses a specific part of the brain more and the people associated with artistic fields use the different one; is talked here. One thing you will notice while exploring these stories would be the way you can relate to them. If not experienced one such incident directly or indirectly, you could’ve possibly came to know about it for sure. Artists only do arts is a story of Mrignayani and Rishi. Both of them share the different vision of the work they are doing. Scientists only do science is a story of Latika, Chetanya, and Jaighosh who are associated with each other with some links (which I will suggest you read to explore). Businessmen only do business is a story of Rahul, Priya, Fatima, and Mr. Sheshadri. These stories are written to explore the conflicting views of people from different streams. The conflict between left-brain and right-brain oriented mindsets are explored quite effectively. Then, the author talks about “Anti-fluidity” and then moves on to explore his views about the change the education system requires. The book is a thoughtful ride from the point forward. While we come across so many books not all of them have the substance which make them worth reading. Fluid is one such book. While I cannot include spoilers here, I suggest you pay attention to the conversation (yes, I will not use the word “writing” here) about Charcle Percy Snow (British scientist and novelist), Ravindranath Tagore, Sir C. V. Raman, Nicola Tesla, Issac Newton, H. G. Wells, E. Sreedharan, Dr. Watson (cancer specialist), Steve Jobs, Bill Gates and others. You come to know about the great physique of Issac Newton, C. V. Raman’s love for music, Leonardo Da Vinci’s exceptional knowledge about human anatomy many more such aspects. Reading the book reminded me of reading some quality magazines like Safari. The author himself is a well-learned person and his knowledge and understanding are reflected quite nicely in his writing. The exploration of various historical legends, especially a comparatively lesser known side of them, is the most interesting part of the book to read. You will come across many things about the characters mentioned above and others like Charles Darwin which you are probably not knowing. Exploring various countries and culture made the author open-minded and thus he can explore the essence from various characters belong to different ethnicity, culture, and countries. But then, if we copy, if our journeys are predetermined and not fluid, how different are we from a machine itself. Since its first model, Apple has been regularly upgrading the iPhone. While Steve Jobs was alive, he personally headed the iPhone design team. But this raises an important question: can an “uneducated” person design-lead one of the most popular smartphones of our time, which is not only aesthetically pleasing but also capable of accommodating continuously progressing smartphone technology – and if so, can he e called uneducated? This question compels us to look at the fixed mindset we have regarding the definition of education: anyone who goes through the formal process of school and college is considered to be educated and those without a degree, the oppoisite. The following passage from the book interestingly analyses the way of living which makes us to mingle with the people having similar interests and eventually blocks us within that circle. It is a kind of self-accepted-prison where we don’t seek anything outside of the box. Think about the time when we choose our subjects after our tenth standard at school. This decision also steers our friendships. Our classroom arrangements separate us from those who have chosen to take other disciplines. How often does a medical student spend time with a commerce or an engineering student? For reunions and alumni meetings, the trend continues to divide us by discipline even after college. Offline or online, we spend our time with similar kinds of people, who all do similar things, have an interest in similar topics and even, more often than not, fall in love from within our circle of acquaintances. To put it simply, a kindergarten should be a garden for children – just a flower grows in a garden, a child should be able to grow in a kindergarten. How simple yet effective exploration it is?! The following passage defines an aspect of the education nicely. It reminded me of a couple of speeches by Arvind Gupta (who was awarded the famous and prestigious Padma honour by Govt. of India; and the work done by known educationist Late Gijubhai Badheka in the same field. According to Frobel, learning as not only to be achieved by reading books – playing with a simple toy could be the most important educational activity for your children. The writing style is crisp and clear. The author used quite a simple language to reach to the readers easily. So despite the book talking about some highly intellectual and philosophical stuff, you will not be “bored” while reading it. Yes, the book is not a coffee table book nor it is for light reading. If you love reading something substantial and pay attention to what you read, the book is for you. The first edition of the book has some printing errors which when brought to the author’s attention he immediately decided to arrange reprinting of the same. It shows the author’s genuine commitment towards spreading the positive approach towards his goal. Embedding some illustrations at the right point works in favor of the book. At the same time, the use of Endnote could have been replaced with the same of Footnotes. So, despite having some attributes of the book are not that great, the idea and overall package are quite good and definitely worth going for. Definitely a book which must have been read. Especially by those who are in the field of education. The growing teenagers and their parents also find much of the substance in the book. You may find it a little pricey but the book is worth the same. Definitely not less than 8 to 8.5 out of 10. Please read all the rules carefully and act accordingly and you can be the winner! What could have been a better way to start a new year by reading such a nice book? !